The basis for Garten_Landschaft OstWestfalenLippe is the high concentration and quality of parks and gardens in the OstWestfalen Lippe area, which is unparalleled elsewhere in Germany. The art of gardening together with productions from the visual arts and the discovery of the special history of these places through art and music gives rise to “the linking of three art-forms”. This is the special aspect of the cultural programme. Garten_Landschaft OstWestfalenLippe is a lasting product of the EXPO initiative known as the 1. REGIONALE “Kultur- und Naturräume” (1st REGIONAL “Cultural and Natural Areas”) of North Rhine-Westphalia, which was managed by OstWestfalenLippe Marketing GmbH. It has been possible to continue the project up to the present day and it continues to be supported by the Ministry for Urban Construction and Living, Culture and Sport of North Rhine-Westphalia. The content of Garten_Landschaft OstWestfalenLippe focuses on the Spatial Creations of the visual arts (curator Dr. Thomas Kellein), the literature festival “Paths through the Landscape” (directorship Dr. Brigitte Labs-Ehlert) and the programme “New Gardens”. Gardens and parks are restored and enhanced under the direction of the Westphalian Office of Landscape and Construction Culture (Project Manager: Horst Gerbaulet) in the Landscape Association of Westfalen-Lippe. The concept could not have been put into practice without the widespread support and the committed involvement of private garden owners. Without these, Garten_Landschaft OstWestfalenLippe would have been incomplete and would have been deprived of many of its highlights and charming details. 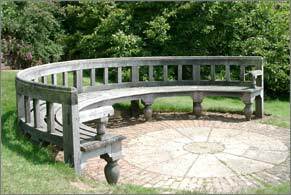 In many cases it was the great interest in cultural events which occasioned the private owners to open their gardens to the public or to restore the garden or historical buildings with care. Thus, some new, notable venues for cultural events have been created which are also used by major orchestras such as “The Royal Philharmonic Orchestra” from London or the “St. Petersburg Symphony Orchestra” for guest performances during the summer months. The “Garden Route of Cultural Events” is the umbrella term under which the participants in the project invite visitors to experience and enjoy the variety of parks and gardens in Ostwestfalen-Lippe as well as their connection with the “three art-forms” and their setting in an attractive natural and cultural landscape. The “representative” selection of five gardens and parks along with ten further characteristic places suggests ways to do this and opens up a vista which reveals surprising insights into the garden and cultural landscape of the Ostwestfalen-Lippe region. More extensive information will be available from autumn 2005, particularly in “Bad Driburg Spa Gardens”, the anchor garden of the region. It is up to you, the visitor, to decide how you wish to explore and experience this regional variety, how you wish to be charmed by the uniqueness of the various towns and places and how long you wish to linger in the area. Covering an area of 6,500 square kilometres, the region known as “Ostwestfalen-Lippe” in the north-east of North Rhine-Westphalia covers about a fifth of the surface area of this Federal Land. More than 2 million inhabitants live in the six districts of Gütersloh, Herford, Höxter, Lippe, Minden-Lübbecke and Paderborn along with the town of Bielefeld. Bielefeld, with 320,000 inhabitants, is the largest town, followed by the diocesan town of Paderborn with just over 140,000 inhabitants. Five further towns have more than 50,000 inhabitants (including Detmold as the seat of regional administration, which has a population of approximately 74,000). The regional landscape is dominated by mountainous terrain such as the Teutoburger Wald (Teutoburger Forest) and the Wiehengebirge and Eggegebirge (Wiehen and Egge mountains) as well as the valleys of the Weser, Ems and Lippe rivers. These, the historical towns and a range of further sights invite visitors, including those from neighbouring regions, to come and explore the area. For many years the region was characterised by small and large principalities. It was absorbed by Prussia in the 19th century at the latest, however, with the exception of Lippe principality, which retained its independence as a state until 1918. Ostwestfalen-Lippe is one of the strongest economic locations in Germany. Well-known companies from the area, among them a noticeably high number of traditional family-run firms, include Bertelsmann, Melitta, Miele, Dr. Oetker, Claas, Gerry Weber and Wincor Nixdorf. Apart from a strong economy, a location’s potential for future sustainability depends to a large extent on the quality of life there. Alongside a strong infrastructure and good opportunities for education and further training, an attractive cultural offer is an important factor. The REGIONALE 2000 in Ostwestfalen-Lippe was the first practical implementation of the North Rhine-Westphalian government’s offer to foster an integrated overall concept based on cultural and natural areas and to support its realisation. For this, 54 projects from the areas of technology, health and culture were co-ordinated and grouped. These were selected on the basis of their forward-looking and innovative nature and were realised by independent groups. Garten_Landschaft OstWestfalenLippe developed from one of these projects and has become the new cultural trademark of the region. Castles and monasteries here are still surrounded by historical gardens with precious trees and plants, Baroque complexes and English landscape parks designed by important landscape gardeners of the 18th and 19th centuries. In addition, the parks of five spas and the complexes of three Landesgartenschauen (regional garden exhibitions) enhance the region. The Garten_Landschaft OstWestfalenLippe programme which has been developed in Ostwestfalen-Lippe does justice to the legacy of garden culture and simultaneously uses the gardens and parks as settings for literature, music and visual art. It is one of the first programmes of its kind. Garten_Landschaft OstWestfalenLippe is the new cultural trademark of the region between the rivers Weser and Ems and the mountains of the Wiehengebirge, Teutoburger Wald und Eggegebirge. The basis for Garten_Landschaft OstWestfalenLippe is the high concentration and quality of parks and gardens in the Ostwestfalen-Lippe. Castles and monasteries here are still surrounded by historical gardens with precious trees and plants, Baroque complexes and English landscape parks designed by important landscape gardeners of the 18th and 19th centuries. 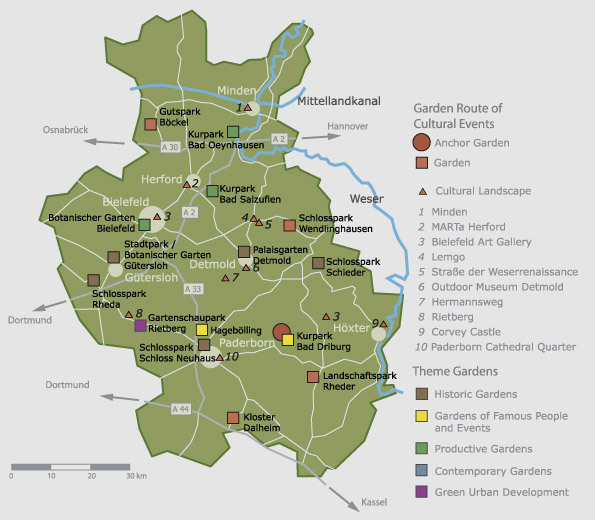 In addition, the parks of five spas and the complexes of three Landesgartenschauen (regional garden shows) enhance the region.The art of gardening together with productions from the visual arts and the discovery of the special history of these places through art and music gives rise to “the linking of three art-forms”. This is the special aspect of the cultural programme. The content of Garten_Landschaft OstWestfalenLippe focuses on “Rauminszenierungen” (spatial creations of the visual arts) (curator Dr. Thomas Kellein), the literature festival “Wege durch das Land” (“Paths through the Landscape”) (directorship Dr. Brigitte Labs-Ehlert) and the programme “Neue “Alte” Gärten” (“New “old” Gardens”). Gardens and parks are restored and enhanced under the direction of the Westfälisches Amt für Landschafts- und Baukultur des Landschaftsverbandes Westfalen-Lippe (project manager: Horst Gerbaulet). Garten_Landschaft OstWestfalenLippe is a lasting product of the EXPO initiative known as the start of the bi-annual programme REGIONALE – Kultur- und Naturräume (REGIONALE – Cultural and Natural Areas) in North Rhine-Westphalia, which was managed by OstWestfalenLippe Marketing GmbH. It has been possible to continue the project up to the present day and it continues to be supported by the Ministerium für Städtebau und Wohnen, Kultur und Sport des Landes NRW (Ministry for Urban Development and Housing, Culture and Sport of North Rhine-Westphalia). The Garten_Landschaft OstWestfalenLippe programme which has been developed in Ostwestfalen-Lippe does justice to the legacy of garden culture and simultaneously uses the gardens and parks as settings for literature, music and visual art. It is one of the first programmes of its kind. It is now a kind of benchmark and a best practice example, which international projects, such as the European Garden Heritage Network, can build on.